The sciatic nerve is the largest nerve in the body, and when it becomes inflamed, it can cause significant pain in the lower back and leg. Not only is the sciatic nerve the longest nerve in the body, it is also the widest. The nerve starts in the lower back, and runs through the buttock and down the leg. It provides nerve impulses for all the skin of the leg, as well as the muscles at the back of the thigh and of the calf and foot. Sciatica is the term used to describe leg pain that is caused by an inflammation of the sciatic nerve. The symptoms of sciatica can range from numbness, feelings of pins and needles and muscle weakness in the leg, to pain that can be quite severe. The pain and symptoms are not always localized and can be felt in the lower back or buttock area or anywhere throughout the leg or foot. Usually, sciatica only affects one side of the body, but it can lead to difficulty moving. Disc injury - This can be a herniated disc, also called a slipped disc, or a torn disc. If sciatica is caused by a disc injury, it is called sciatic neuritis. Spinal stenosis - This condition is caused by a narrowing of the spinal column or the bony canal where the sciatic nerve passes through. Spinal stenosis is a chronic condition that is common with aging. As the spinal column or bony canal narrow, they press against the nerve, which causes pain and inflammation. 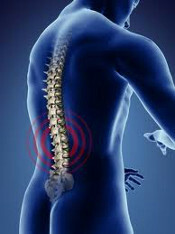 Lumbar facet syndrome - This is also a chronic condition that is affiliated with age and changes due to arthritis. Facet joints appear in pairs at the back of each vertebrae of the spine to allow movement. Over time, they can degenerate, which can lead to compression of the sciatic nerve. Lumbar facet syndrome is more common in the elderly, although it can be caused by a facet joint sprain. Trapped nerves - When it comes to the sciatic nerve, it becomes "trapped" when the surrounding muscle contracts and squeezes it. Chronic muscle spasms can cause the tightness and may be due to imbalances of the spine and pelvis and degenerating discs. This is commonly called "wallet sciatica" as it is caused by sitting on a wallet for long periods of time. Before treatment can begin, it is important that the underlying cause of the sciatic symptoms is diagnosed. In order to determine if the pain is caused by the sciatic nerve, and why it is being caused, chiropractors will take the time to evaluate the entire spine, hips and leg that is symptomatic. In this way, not only will the correct symptoms be treated, but further damage by incorrect treatment will be avoided. Treatment is dependent on what is causing the sciatic symptoms, and because different parts of the body are the root cause of the pain and inflammation, chiropractors approach each diagnosis differently. During your initial visit with a chiropractor, joint range and motion, potential disc injury, muscle spasm and ligament injury will all be tested. Also, your overall posture and walk will be evaluated. All of these tests will point out what is causing your pain. Once the cause of your symptoms has been determined, the chiropractor will provide a treatment plan. This plan will be determined by the root cause of the condition and can involve spinal adjustment, spinal manipulation, manual therapy of soft tissues, like muscles and ligaments, and therapies to reduce the inflammation, such as ultrasound treatment. Spinal manipulation and adjustments are used to improve joint motion and return soft tissues back to a healthy state. Depending on the patient, they can be hands-on and apply force directly to the affected joints, or more gentle with indirect force applied. Manual therapy involves applying pressure to muscles in spasm to release the tension and also stretching and resistance exercises. Finally, ultrasound or electrical stimulation may be used to reduce inflammation of the area and may be required before or at the same time as the other methods of treatment. Whether your sciatic symptoms are caused by mechanical damage or nerve-related damage, working with a chiropractor is sure to reduce, if not remove entirely, your discomfort so you should be able to get back to your daily life activities. Greetings from Schelin Family Chiropractic! Family-oriented practice focusing on the health and well-being of every patient.